Since 2012 we have seen a vast growth in popularity of one of the most ancient practises in human history: archery. It can be said that this great rise owes much to the phenomenon that has become the ‘Hunger Games’ movie franchise. The huge success of these movies boasts largely from the appeal of their main character and heroine ‘Katniss’ who chooses one simple weapon as her best form of defence: the bow and arrow. In comparison to the historical practice of archery, the Hunger Games adapted a unique take on the activity that greatly appealed to young women and families in particular. As a sport, archery had much more to do with practise and determination than physicality, making it an activity that broke all age and gender barriers. Armed with a bow and arrow the most delicate young girl could be a staunch opponent to her strong male counter-part. 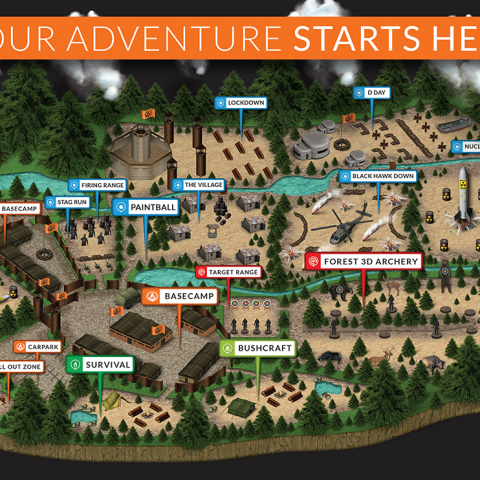 With all of this in mind, we decided that an archery course like no other had to play a huge role in our new adventure park. The unique appeal of archery entails that a wide variety of people of any age, gender or fitness level can take part. While going through the brain-storming process for our archery course here at Basecamp we did much research on the history of archery and how it is played today. For our action packed adventure park we didn’t want your regular archery game where contestants line up one by one firing arrows endlessly at a target board. ‘Archery is one of the oldest arts still practised’ and we wanted to give it a 21st century edge. Initially, archery was utilised as an effective method for hunting wild animals for food and as protection from enemies during ancient times, however, with the invention of gunfire archery quickly became an outdated method. In modern times archery soon transformed into a recreational activity and our aim here at Basecamp Adventure Park was to make it as enjoyable as possible without growing stale and boring. In doing so we created a purpose-built 18-target 3D forest archery course right here in the middle of Basecamp. Participants weave through our course aiming for 18 separate 3D targets set at various skill and distance levels. Before you start your game with your group, each person is given a score card to add that much needed competitive edge to the activity. Our targets are placed deep in our woodland area ranging from wild animal to maniac zombie targets that test your ability to fire. Our archery packages have become especially popular with families, this activity allows both adults and kids to play together rather than having the parents just sit back and supervise. This aspect of archery has added to its rise in popularity as adults and kids alike get to take part in a bonding experience like no other. 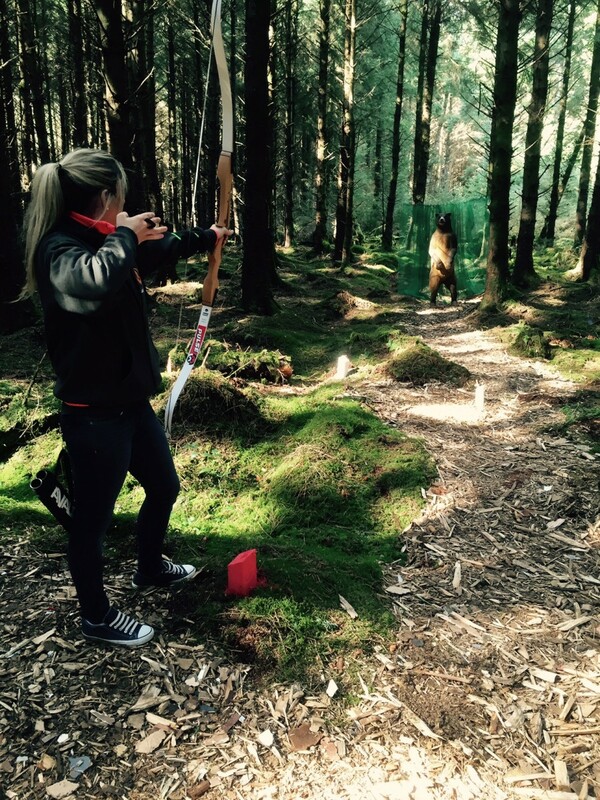 From the early days of Basecamp, archery has also proven to be a big hit with stag groups looking to try something different and even with hen parties looking for a bit of adventure. Our archery adaptation has also proven extremely popular with corporate groups who are looking for that perfect team-building experience with a competitive edge. Some have even tried to further boost staff morale by placing pictures of the boss over our 3D targets, we do not recommend targeting the real thing! Our two hour 3D forest archery experience includes a full training brief from our resident archers who will accompany you throughout your game. Our archers aim to make you learn as much about the ancient art as possible and to provide you with tips to accentuate your skills as greatly as possible. It will be clear by the time you arrive at the final target you will be a much more skilled archer in comparison to your first attempt to shoot. And who knows maybe this time next year you could be joining our own Irish team in the 2016 Olympic Games.